My friend’s allusion to the communists concerns a decades-long anti-communist argument used by the power elites. The argument went that if the communists came to power, they would confiscate people’s homes. It was recently used by far-right health minister Adonis Georgiadis. In fact, small real-estate property is being confiscated under capitalism. People are losing their homes to the banks for failing to meet mortgage payments, or to the taxation department for accumulated tax debts. Home confiscations have been facilitated by a recent law enabling seizure of salaries, pensions, bank savings and property for even small debts to the state. There are specified debt amounts that incur property seizure or jailing. They vary according to the recipient (whether the money is owed to the taxation department, a public insurance fund etc.). The different amounts are often changed by the government. The latest ministerial circular (issued on April 15, 2014) concerning tax debts sets the line at 1500 euros. The number of confiscated homes has risen in recent years. A big wave of new house seizures is expected soon. The finance ministry has made an agreement with the “troika” (the European Union, European Central Bank and the International Monetary Fund) to set the opening bid at auctions at 30% of the houses’ real values. Financial hardship, combined with recent law changes, has led to a dramatic rise in debt-related jailings. People are kept in barbaric and unconstitutional prison conditions. The vast majority of people are bound to have difficulty paying their mortgages or to run up a tax debt sooner or later. This is due to the extreme austerity measures imposed on Greece at the behest of the “troika” in agreement with Greek governments. People in Greece are suffering high unemployment (officially well over 27%, the highest in Europe), huge income cuts, rising prices of basic goods, unfair and unpayable taxes and the sky-rocketting fees imposed on many middle-class professionals. Since the first “memorandum” agreement signed with the troika in May 2010, real-estate taxes have risen by 684%. Overall taxation has risen by up to 900% since 2010. In addition to many other irrational measures, people are now asked to pay tax on “implied income”. In practice, this means that even if you have no income, chances are you’ll have to pay a considerable amount of tax. “Implied income” is based on the assumption that if you can afford to maintain a home or a car, you have a source of income. This has especially serious implications for most unemployed people, as about only one-tenth of the officially unemployed are currently receiving the unemployment benefit. What’s more, the income tax for 2014 is set to rise due to the abolition of most tax exemptions and deductions. Individual taxpayers are expected to pay taxes of 800-1000 euros more than for 2013, while the clear minimum wage has dropped below 480 euros per month. The situation was already pretty bad before the first memorandum. It has been getting much worse since the so-called “aid” from the troika and the required “structural adjustment” reforms it comes with. Despite their stated aim, the loans given to Greece were intended to destroy rather than help the country’s economy. In May 2010, Greek public debt was 120% of GDP. Today, after four years of savage measures, it is 175% and growing. Most of the bailout money is used to pay off previous loans and excessive loan interest. It is also handed to parasitic banks and insurance companies. 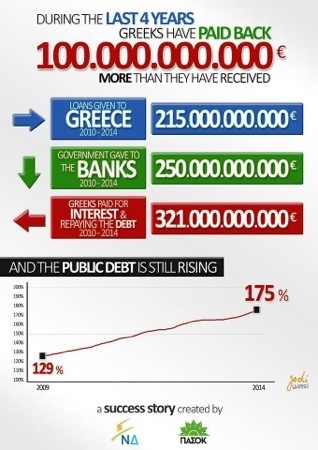 On top of that, the people of Greece have paid 100 billion euros more than the loan given to their government. In a cynical statement in January, Greece’s Prime Minister Antonis Samaras confirmed that the people of Greece have suffered a drop in living standards greater than any other people has since the end of World War II. Even though the people and the economy are all but crushed, the government is triumphant about a supposed current or ever-imminent economic recovery. But, despite the government’s show of optimism, the disastrous policies it follows are not conducive to development. The “structural adjustment” memorandum-dictated measures are leading to total pauperisation and helplessness, the complete destruction of the country’s economy, the theft of all its public and private property, and the abolition of hard-won social and workers’ rights. As in most parts of the world, capitalism is again openly showing its hideous face, even in Europe, which has been touted as the stronghold of democracy and welfare. The deliberate economic and social destruction by big capital in many countries is clearly expounded by Naomi Klein in The Shock Doctrine. Also, the documentaries Debtocracy (2011) and Catastroika (2012) (with special reference to Greece) are enlightening about the ways global capitalism works to subjugate whole countries and their peoples. Greece is the first eurozone country to be subjected to this fate, being often referred to as a “test case”. The implication is that the same savage policies are to be applied to other peoples if the experiment turns out to be successful. The measures taken in Greece are spreading to other countries too, especially in southern Europe. The violent destruction of Greece’s economic order was effected through the memorandum agreements. However, it had started decades before, especially after the country joined the European Community (the previous form of the European Union) in 1981. In 1976, industrial production was about 34% of GDP. In 2000 it dropped to almost 21% and in 2008 it reached 19%. The agricultural economy was clearly restricted by European Common Agricultural Policy agreements. Agricultural production was 14% in 1976, 7% in 2000 and dropped to 3% in 2008. Between 2010 and 2013 GDP was further reduced by 40 billion euros. Since the first memorandum, the country’s decline has been much more rapid. Greek governments have been continuously changing the legislation to enforce more and more anti-people measures. To achieve their ends, they use any means, including breaking their own laws. Ministers or even the prime minister can be appointed at will, as has been the case with ex-prime minister Lucas Papademos and current finance minister Yiannis Stournaras. Important decisions are made by presidential decree and bills are rushed through parliament rapidly and quietly. There is serious criticism by experts that the imposition of the memorandum was unconstitutional. The assertion is based on the grounds that the constitution-specified parliamentary majority of three-fifths of the number of MPs was not adhered to when Greece was put under troika supervision. Like legislation, the judicial system favours the dominant class against ordinary people, who more often than not cannot get justice when they are wronged. The major drawbacks are the expenses involved, long waiting periods and unfair verdicts. Inequality and injustice are extreme on all levels. The memorandum offensive is all-sweeping. Hospitals and other services are closing down. Thousands of schools have closed and class sizes in the remaining schools have increased. Many job positions are lost and people are left without essential services like education, medical care and medication. Salaries and pensions have been cut by about 40%. Reduced incomes are compounded by rising prices and unreasonable taxation measures, high unemployment, widespread underemployment and sackings in the private and public sectors. It is the first time since 1911 that public servants have been dismissed. In both the public and private sectors, working conditions have deteriorated immensely, which is facilitated by newly introduced legislation. Also, many employers get away with further violations of workers’ rights. About 50% of workers have not been paid for up to 18 months. Unpaid overtime, intensification of work, illegally low wages, extra duties and extra working time are now rampant, especially in the private sector. Working conditions of public employees have also worsened. For instance, in the teaching profession, there has been an increase in face-to-face teaching hours and student numbers per class have increased. These changes have raised stress levels and have affected the quality of teaching and learning. They have meant the closure of thousands of schools with the accompanying loss of thousands of teaching positions, especially since 2011. In recent years, teachers are also forced to do administrative work traditionally done by clerical staff or sub-principals. People are robbed of their free time when they are forced to do work previously performed by specialised employees. That was the case with recent public servant censuses, which involved the employees’ filling out complicated forms and submitting them online in their own time. In the same spirit, taxpayers now have to download tax documents and file their tax returns electronically, irrespective of their PC and Internet skills or access. Self-employed professionals are now required to do intricate time-consuming bookkeeping work constantly and submit records to the taxation department monthly. Failure to meet the deadline incurs a fine of 250 or 500 euros. The fines were originally 1000 and 2500 euros respectively, but were subsequently reduced. All tax penalties in the revised tax code are absurd and exorbitant. Besides eating into people’s free time, these unprecedented measures cause a lot of stress. Some of them directly lead to the downsizing of public services by making job positions redundant. As a consequence, the remaining employees work more hours and more intensively for less money. And the chain-reaction effect does not stop there. Reduced consumer spending ability is the main cause of the closure of small and medium-scale businesses. State-imposed excessive financial burdens on consumers and shop owners also play a large part in the closures. Thousands of shops fold up every month. Against this background, social problems such as homelessness, crime and prostitution are on the rise. The same goes for psychological and health problems. Another big social issue is the electricity cut-offs to hundreds of thousands of households for unpaid bills. This, together with the high cost of other conventional heating methods, has resulted in fatal accidents caused by makeshift heaters. In keeping with its anti-social policies, the establishment follows blaming-the-victim tactics. In this spirit, it opts for punishment over social and preventive measures. As a result, prisons have filled well beyond capacity. The conditions are inhumane, as are the conditions in migrant concentration camps. Health care in prisons and migrant detention centres is almost non-existent, so prisoners are left untreated and they often contract diseases. Physical abuse of inmates is another common occurrence. It is the first time in the country’s history that there are concentration camps for migrants. Thousands of people are detained there in appalling conditions. Currently, a new prison is being constructed in an ex-military camp in the city of Korinthos by George Bobolas. He is a super-rich industrialist, media magnate, real-estate owner and national roads contractor. He has huge interests both in Greece and overseas. Among these interests are the mine in Skouries, the road tolls on badly constructed national roads and the well-known Keratea dump business, whose construction has been frozen due to the magnificent struggle of the town’s residents. The prison under construction is reported by certain sources to be the first specialised prison for financial “criminals”, that is, for people unable to pay off even small tax debts. At the moment, the premises serve as a concentration camp where 1200 “illegal” migrants are confined in harsh and barbaric conditions. There is a very fine line between living free and being in prison for many people in Greece these days. About 2,500,000 people have outstanding debts to the state at this time, which makes them potential prisoners and highly vulnerable in many ways. Once people lose their freedom, many possibilities are opened. Not surprisingly, my stall-holder friend who wants to leave Greece is in good company. Hundreds of thousands have emigrated in recent years and about 400,000 are considering it. The emigration rate is rising by almost 40% a year. Emigration has played a big part in Greece’s population decrease. It is the first time in modern Greece that a population decrease has been recorded. The drop in the birthrate, combined with a higher death rate, is another factor. The rising death rate is due to greater illness levels, compounded by the shocking state of the national health-care system and high medication prices. Growing numbers of suicides add to the death figures. Greece is leading the world in its rising rate of suicides. Memorandum-related suicides are estimated to be up to 6000. Due to the secrecy around the issue, the exact number is not clear. As the vast majority of the people suffer, Greek and foreign big capital are making huge profits. Government officials, like Georgiadis, state publicly that suffering is a fact of life. Such statements are intended to make people resigned to the current situation and prepare them for more of the same. And there is worse in store. Troika officials keep saying the country is not ready for profitable investment yet. At the same time, they are pressing for further salary cuts. The objective is the maximum plunder of Greece’s natural wealth and exploitation of the people. On May 6, Greek vice-president Evangelos Venizelos made a telling statement during a TV interview. He said that in Moldavia, which he claimed “is practically next to Greece”, there are wages of 70 euros per month. He concluded that Greece is a country with a really high standard of living. Official papers and statements reveal plans to cut the minimum monthly wage to 200 euros and further increase “flexibility” in working conditions. Other plans include more tax increases and pension cuts, instituting labour hire, pillaging the country’s forests, closing public services and transferring them to private concerns, sacking tens of thousands of public servants in the next few months, creating a permanent public service mechanism for sackings and introducing individual pay for public servants based on performance assessment. Currently, the government is trying to enforce an evaluation plan that is a pretext for more closures and sackings. The relevant law sets quotas for the classification of public servants in every single workplace into outstanding (25%), competent (60%) and inadequate (at least 15%). Those judged to be inadequate will be sacked. The law is harsh and unreasonable, something not uncommon in the current political “paranoia”. The presumption that at least 15% of employees in each workplace are incompetent does not stand to reason. What’s more, according to the relevant government circular, failure of the assessor to conform with the quotas specified would constitute a disciplinary offence. The “inadequate” employees will be marked from 1 to 6.9. An illogical stipulation states that only those with marks 1-6 will have a right of appeal, while the ones getting 6.1-6.9 will not. The reaction to the planned assessment has been quite strong, forcing the government to tactical maneuvers. If the government is not stopped, the consequences will be tremendous. Tens of thousands (the plan is for 150,000 sackings by the end of 2015) will lose their jobs. This will adversely affect the economy, add to the existing social misery, and deprive the people of even more badly-needed services. As the people of Greece are robbed of their basic rights, public goods and services are being privatised. Electricity, water, ports, beaches, the national broadcasting service, national health care and education are only a few examples. Greek banks, after robbing taxpayers of tens of billions of bailout money, are now sold out at bargain prices to Greek and foreign capitalists. In August last year, about 50 public vocational education specialist courses were abolished. About 2500 teachers lost their jobs and about 20,000 students were thrown out of highly popular courses (e.g. nursing, plumbing, hairdressing and physiotherapy). Within days, the same specialist courses appeared in private teaching centres. Opening up professional fields is another way of transferring material and human resources to big corporations. Deregulation has been viciously pursued by the government in businesses such as pharmacies, taxis and trucks, and more recently in open-air “people’s” markets. Similar moves include facilitating milk imports at the expense of local producers and the enforcement of extended opening hours, especially introducing Sunday trading, which will wipe out small shops. While shops have already been closing by the thousands, there is an exception. Pawnbrokers’ shops have mushroomed, being one more way of stealing people’s wealth. There is a lot of resistance to these policies. However, it hardly has any results, as workers from different professional categories are largely isolated in their struggles. Major reasons for this are the dominant divide-and-rule propaganda, which is promoted by the media, as well as divisive and ineffectual tactics of sell-out trade-union leaderships. The whole country is up for grabs by privateers. Whole areas are sold out for exploitation, such as the mines in Skouries, Thrace and Kilkis. The struggle against this plunder is dynamic and ongoing, most characteristically in Skouries. In such places, as well as in ports, Special Economic Zones and Free Zones have started to materialise. Their purpose is to ensure high corporate profits of “investors” through slavery-type conditions for workers and overall unaccountability. These measures are accompanied by heightened authoritarianism. The erosion of democratic rights and police repression are reminiscent of totalitarian regimes. Police brutality is mainly aimed at those resisting the government’s policies. Unlawful arrests, detention and prosecution practices have been extreme. Many people are persecuted for their political views and legitimate action. Strikes and political rallies are banned to an extent not seen since the end of the military junta in 1974. The police have been given excessive powers, including the power to arrest impoverished people for tax debts. Among those arrested, there have been many feeble elderly people. Also, there have been many reported cases of torture of activists and migrants, for example, in police custody or in detention concentration camps. The case of Ilia Kareli, a prisoner of Albanian origin who was tortured to death by correctional officers last March, is indicative of such practices. Racist attitudes that go unchecked pose a great risk for migrants. In April last year, about 200 migrants were chased and shot by their employer’s foremen and at least 28 were transferred to hospital. They were working in strawberry fields in the area of Manolada of Ilia. Just before the event, they had met with the foremen and demanded overdue wages of six months. These kinds of practices are akin to Neo-Nazi Golden Dawn’s actions, whose members, usually in gangs, have been attacking and killing innocent migrants on the basis of their appearance and social standing. Leftist individuals, groups and offices have also been targets. Last September, Golden Dawn thugs murdered a non-migrant, anti-fascist rapper Pavlos Fyssas. Golden Dawn paved the way for an exacerbation of the government’s racist rhetoric and measures. Like extreme-right Popular Orthodox Alert (LAOS) before it, the neo-Nazi gang has been given disproportionate media exposure to suit the needs of the establishment. Even though Golden Dawn pretends to be on the side of ordinary people, it has strong connections with big private interests and works for them against union struggles. The criminal gang’s MPs also vote in favour of big interests in parliament and they even support the country’s sell-out, exposing the falseness of its pro-people and patriotic façade. LAOS, a “softer”-profile fascist organisation, was a precursor of Golden Dawn. It gave ideological support to the government and participated in the undemocratically formed provisional government in November 2011. In a similar way, Golden Dawn’s racist ideas and criminal action suit the government, as they push forward the government’s political agenda. For this reason, the neo-Nazis are allowed to run wild, committing political and common law crimes, often with police cover. This started many years before the memorandum and has been going on under successive governments of the two ruling parties. At the same time, like its predecessors, the current government enforces inhumane border controls. Such policies have caused a great deal of pain. Many people have died while trying to enter Greece in order to escape terrible conditions in their countries. Two recent examples are the people who drowned off the islands of Farmakonisi and Samos. The great majority of refugees use Greece as a transit point to other European countries. As the government puts on an anti-fascist act, it violently represses left-wing, anti-fascist actions. Furthermore, Venizelos recognised the far-right government of Ukraine, thus legitimising the neo-Nazi atrocities there and the planned destruction of the country. Also, there are members of the Greek government who are openly fascist. Two of its ministers, Makis Voridis and Adonis Georgiadis, have a well-known history of far-right activity. Another far-right government official, Panagiotis Baltakos, who was general secretary of the Greek government and Samaras’ right-hand man, was forced to resign in April. The reason was a big scandal concerning a videotaped private talk between him and Golden Dawn top member, Ilias Kasidiaris. On the tape, Baltakos appeared to be on very good terms with Golden Dawn. The mood and the content of the conversation were quite compromising for himself and the government. Both the government and the neo-Nazis serve the interests of big business. Fascism is called to the system’s rescue when bourgeois democracy has reached its limits and can no longer serve corporate objectives. The connection between big capital and fascism is clearly shown in the recent documentary of the makers of Debtocracy and Catastroika, Fascism Inc.
On the bright side, an ongoing strong anti-fascist movement from the whole of the left has helped raise consciousness and contain neo-Nazi activity. The anti-fascist movement has had some apparent success. Other successes of the people’s fightback include a judicial win by sacked school guards and the government’s withdrawal of a planned 25-euro hospital admission fee. Although such victories can boost people’s confidence and increase awareness, the tangible gains do not last long, with the government always finding ways to realise its plans. A sign of increased political consciousness is the shift to the left of the balance of forces in some trade unions. Furthermore, the left is making conscious efforts to set up new union groups and counter sell-out top-tier leaderships. With the coming combined Greek local and European Parliament election on May 18 and 25, a lot of hope is invested in an electoral victory of the Coalition of the Radical Left (SYRIZA). SYRIZA representatives express a belief that it will win the highest vote of any Greek political force in these polls, which will instigate national general elections. But the system has so many means of manipulating voting choices that a SYRIZA win is not certain. For one thing, new capitalist parties have formed and some are promoted by the media to diffuse the vote. Forty-three political parties are going to take part in the coming elections. As part of the effort to fool the electorate, the Greek government has tried to keep secret its new agreement with the troika, which has been revealed. At the same time, the government is handing out a one-off 500-euro benefit to the most disadvantaged. Ostensibly, the intention is to share around a supposed budget surplus. The government and the mainstream media have been making a big deal of this surplus, which they attribute to economic development. In reality, the extra money comes from the merciless robbery of ordinary people. Besides, due to strict eligibility criteria, the benefit is given to very few. The ruling parties are running an election campaign on accusations against SYRIZA, fear-mongering, lies and deceit. In the 2012 general national elections, they maximised their vote through false promises and scare tactics. They are employing similar methods this time and they may also have last-minute tricks up their sleeves. There is a strong likelihood of early national elections. But even if SYRIZA wins government in the next national elections, it would need the support of a strong popular movement. Therefore, SYRIZA should step up its efforts to stand by the grassroots movement, increasing political consciousness and rallying support. The powers-that-be are well aware of the implications of this radicalism. So they have been trying hard to tame SYRIZA and cut it off from the people’s struggle. Although SYRIZA keeps promising it will annul all memorandum-related laws, some left-wing forces are questioning it. They accuse SYRIZA of being an establishment party and deliberately misleading the people. These practices do not help promote the badly needed unity of the left, which SYRIZA is trying to encourage. It is imperative that left forces stick together against vested interests. They must not compromise, but find effective ways to organise and earn the people’s trust, so they can work with the people to reverse the catastrophe. If this can trigger a similar change in other countries, there might be some hope for a better future. Coordination of the struggle across Europe and other neighbouring countries could prove essential in the current circumstances.